Twenty two miles off the Southern California shore, a serrated mountain range rises from a sapphire sea. It is close enough to be a playground for L.A., yet distant enough to have been a safe harbor for nineteenth century pirates and Prohibition era hooch-runners. This 21 mile long island has a near perfect climate: cooler in the summer and warmer in the winter then L.A. Santa Catalina feels like the Mediterranean Riviera, averaging between 67 and 78 degrees year ‘round. The day we flew a small plane into “The Airport in the Sky” atop Catalina the air was sparkling clear while a brown smudge of dust and smog lay above Los Angles. Most visitors arrive by boat service from the mainland to Avalon, a small town with a big resort attitude. But that wasn’t always so. During the forty minute drive down a curvaceous road from the airport to town Frank Strobel, our driver, told us about the unique aviation history of Catalina. Beginning in the early 1920’s the small, protected harbor of Avalon was groomed as a resort destination by William Wrigley, Jr., of the Wrigley chewing gum company. He pumped millions into infrastructure and attractions and bought several luxurious steamships to bring visitors to Avalon. About the same time Syd Chaplin, half-brother of Charlie Chaplin, began seaplane service to the harbor in a three-passenger Curtiss “flying boat”. When flying service between the coast and Catalina Island began in July of 1919 it was the first regularly scheduled air passenger service in the U.S.
About this time Catalina became renowned for developing a new sport… big game fishing. Schools of swordfish, marlin, tuna and other “fighting” fish congregate in the straights between L.A. and Catalina Island. The Tuna Club, the oldest fishing club in the U.S., was established in 1898 to elevate fishing into an esteemed sport and aid in the conservation of local species. The Tuna Club counted Theodore Roosevelt, Winston Churchill, Charlie Chaplin, Cecil B. DeMille and Bing Crosby as members. An article in The Los Angeles Times on July 13, 1922 reads “Flying Fishermen were introduced to Southern California recently when a party of thrill-seekers hopped in a Pacific Marine Airways flying boat, spotted their game from an altitude of 500 feet, landed and caught 200 pounds of assorted varieties of fish. The ease with which this feat was accomplished demonstrates the versatility of the seaplane as a sporting craft.” A photo accompanying the article shows a lovely young women reeling in her catch while sitting on the airplane hull. Wrigley continued to encourage tourism with the building of Avalon’s most recognizable landmark, an art deco theater and dance hall called “The Casino” (“meeting place” in Italian). A sumptuously decorated theater, the first to be built with a sound system for the new “talking pictures”, occupies the ground floor. A broad ramp leads upwards, passing bars and gathering places to an immense circular ballroom. Thousands of dancers packed the floor for all night dancing to big bands. With first light they caught the Wrigley’s steamships for the trip back to Los Angeles. For those who needed to get back quicker, floating planes competed for their business. By 1931 planes could make the passage to the mainland in just 15 minutes. The Douglas Dolphin was beautifully upholstered and could carry 10 passengers in luxury. A panoramic view of sunrise on Avalon was included in the $5.00 fare. Two weeks after the bombing of Pearl Harbor Catalina Island was declared a military use zone and all steamship service ceased. Air service continued another 9 months until it, too was halted and the amphibian planes requisitioned by the Army. By the end of the war, all seaplane landing facilities had been dismantled. Construction of a new airport, achieved by carving off the highest peak on the island for a runway, was completed in June 1946. One month later, United Airlines initiated a new route between Catalina’s “Airport in the Sky” and three mainland air terminals. These larger twin-engine planes could carry more than twice the passengers as the sea planes plus freight. As we neared our destination we asked Frank “so, did seaplanes ever return to Catalina?” Frank loved seaplanes and had flown for several island airlines over the years. “Well, in 1984 I convinced my wife, Irene, that we should buy a Grumman Goose seaplane and start an operation. I don’t know why she emptied her savings account, but she did.” Their company, Catalina Flying Boats, began by hauling freight and soon expanded to carrying passengers from Long Beach. Frank flew passengers until the end of the summer season, 1987. 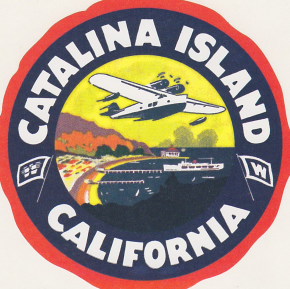 His was the last airline to offer seaplane passenger service to and from Catalina Island. 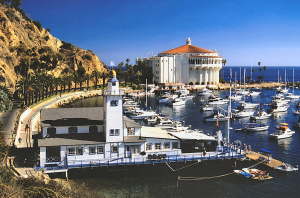 To visit Catalina you can take one of several boats or a helicopter. The Tuna Club still operates big game fishing tournaments from its elegant clubhouse on the harbor. During our recent visit we enjoyed dropping by the scoreboards on the dock to see which boats were winning the 3-day catch-and-release tournament that was in progress. The Casino theater and ballroom are still operating. The building design and décor are spectacular. Catching the afternoon tour was a highlight of our stay in Avalon… that and meeting Frank. The gap between WWII and 1984 was not without seaplane service. When I lived there in 1970-72, we often used the regular seaplane service from Long Beach airport to Avalon Bay. It was a magical transition, from one world to an entirely different one in just a few minutes, with a thrill at the end as the pilot dodged yachts to land as close to the pull-out ramp as possible. The planes could also be chartered for special pickups, as from Toyon Bay where the Catalina Island School was then.